TME consequently promotes students scientific initiatives, in particular those connected with robotics and new technologies. We have already sponsored several robots sumo wrestling contests in various cities. This time, the company has decided to support Eastrobo 2013 competition that will be held on March 23 in Białystok. Eastrobo is a robots contest organized for the second time by students scientific circle “Mobile Intelligent Systems” acting by the Faculty of IT Sciences of the Białystok Technical University. The purpose of this event is to popularize robotic sciences among young people and students. 2012 edition enjoyed considerable interest among participants as well as among visitors. 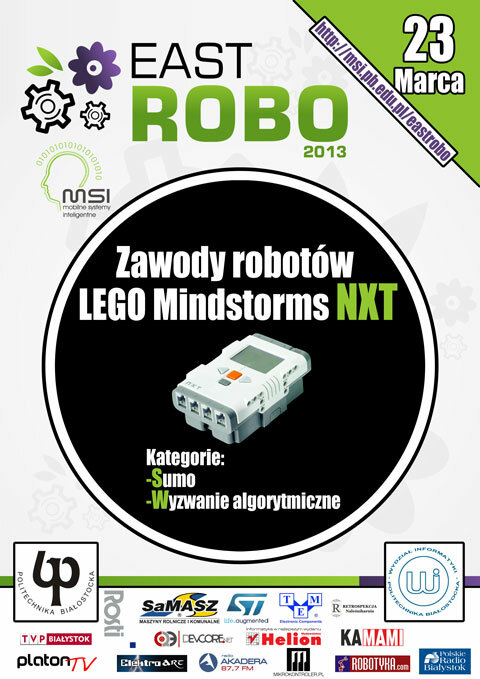 Teams from all over Poland have been invited to take part in Eastrobo 2013. The event comprises of two competitions: Sumo wrestling and Roofer. Organizers are planning to invite 20 teams consisting of two, three members that will take part in each competition. Robots taking part in the contest must be made of precisely specified components, including LEGO blocks and must be of specific dimensions (in case of a Roofer competition) and weight (in case of Sumo wrestling). Strict regulations specify behaviour of a robot in the ring, and breaking them might lead to disqualification. SUMO Wrestling includes a combat of two robots. One of the robots must push the other robot off the ring. Robots dimensions cannot be bigger than 30x30cm at the basis, and weight more than 1,5kg. They can be programmed in any environment. ROOFER contest is connected with the land of Eight-bitters story in which the Ministry of Health issued an Order to remove roofing paper from all the roofs. All roofs in the region are flat, but the task is not an easy one, because there are multiple, irregular chimneys on the roofs. Master ErNESt, offering services of removing roofing paper, is unable to come forward with a smart way of quick doing the task and robots taking part in this competition are to help him in this. For this purpose, they have to visit all empty fields abiding by moves principles. Entering a field with an obstacle or the field that has already been visited leads elimination from the contest. We invite both potential robot designers as well as visitors to visit the Eastrobo contest. For those, for whom the trip to Białystok seems to be too distant, we have good news: contest will be broadcasted via the Internet.